We are happy to announce that Custom and Certified Connectors in Power BI are now generally available! After delivering the Power BI Custom Connectors SDK, our incredible community has developed hundreds of connectors. 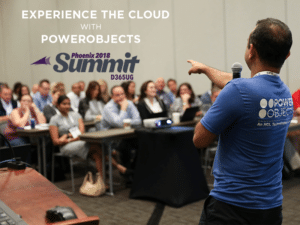 Some of these were developed by vendors, some by consultants, and some by third parties who were passionate enough about Power BI to write connectors for specific data sources. It’s been an incredible success, and we’re happy to announce it is no longer a preview feature! Custom Connectors for Power BI are modules that extend Power BI’s capabilities to connect to data sources not covered by what’s shipped with the product. We’ve seen these used to connect to databases, web services, and even specific private data sets (such as census data). As this feature is no longer in preview, connectors are now fully supported in Power BI Desktop, the On Premise Data Gateway (Personal and Enterprise), and Power BI Service (via the Gateway). We support both refresh of data through import as well as direct query for those connectors that support it. We also have now have a dedicated Power Query section on Microsoft Docs, with all the information you might need to develop a Custom Connector, alongside our existing M Language Reference. 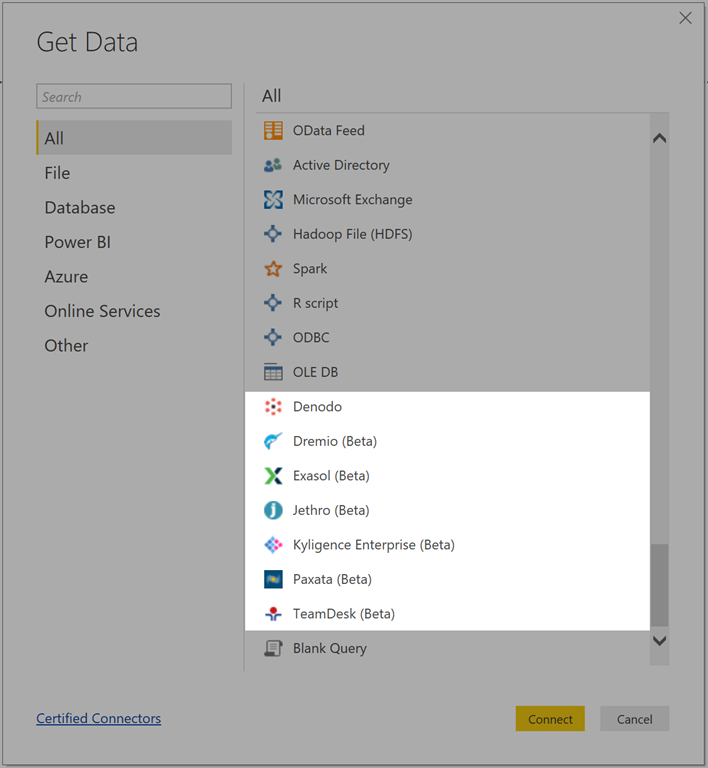 This program will allow owners of data sources to deliver connectors seamlessly via Get Data in Power BI, making it easy for you to take advantage of the capabilities of Power BI and the breadth of our audience. Connector support is provided by the connector owner, with assistance to the connector owner from Microsoft. If you’re a vendor interested in certifying your connector, reach out to us via this form. More information about requirements can be found here. We encourage the community to use custom connectors to enable bringing all their data into Power BI, not just from sources we already support. Many vendors have reached out to work with us already, and more information about some of the connectors we’ve already certified are below. Custom Connectors are now Generally Available and every Power BI user is encouraged to leverage them – whether that is building new connectors or leveraging connectors built by others. This includes Certified connectors that are distributed seamlessly, as well as using other Custom Connectors built by 3rd parties. We have new security settings under ‘Security’ in ‘Options’. If you’d like to know more about the security levels, please read the documentation page here. You’ll note that there are two security levels currently—one for ‘custom connectors’ and one for ‘certified connectors’. Because we go through all certified connectors to make sure they’re safe, we’re willing to distribute them at the higher level of security. However, to ensure your security, modules not certified by Microsoft will not load without changing security settings. We are aware that there are lots of connectors don’t fall into the certified path, as mentioned above. Sometimes, however, you may trust a vendor to provide you a connector that (for whatever reason) isn’t easily certifiable. It could be a data back-end they don’t own, it might be a specific data set, or it might be a private database technology not generally available on the market. There are lots of reasons, and we will do our best to support this use-case. As mentioned above, we’ve worked with a number of vendors already on the Certified Connector program. Below is a blurb about each of them. Some of these connectors (Exasol, JethroData, and TeamDesk) were introduced under the feature switch a few months ago—check them out! The others are brand new with the October release of Power BI. All statements below, aside from learn more links, are taken from the ISV. Dremio is a data-as-a-service platform that empowers users to discover, curate, accelerate, and share any data at any time, regardless of location, volume, or structure. EXASOL is a high-performance, in-memory, MPP database specifically designed for analytics. From business-critical data applications to advanced analytics, EXASOL helps you analyze large volumes of data in real-time, helping you to accelerate your BI and reporting, and to turn data into value. With EXASOL, you can benefit from real-time analytics in order to improve operational efficiencies, drive business growth, improve customer acquisition rates and deliver excellent customer service. Kyligence provides a leading intelligent OLAP platform powered by Apache Kylin to enable interactive big data analytics with high concurrency from on-premises to the cloud. Deployed on Azure HDInsight, Kyligence helps you matching the dynamic computing and analytics requirements, reducing the operation cost and accelerating business analytics on the cloud. Kyligence is now available on Azure Marketplace. Paxata is a visually-dynamic, intuitive solution that enables business analysts to rapidly ingest, profile, and curate multiple raw datasets into consumable information in a self-service manner, greatly accelerating development of actionable business insights. In addition to empowering business analysts and SMEs, Paxata also provides a rich set of workload automation and embeddable data preparation capabilities to operationalize and deliver data preparation as a service within other applications. Custom and Certified connectors for Power BI are now generally available! We encourage the community to use them and experiment with them, and we would love for vendors to reach out to us about certifying their connector. Information on the certification process can be found here, and you can nominate your connector for certification here. The scariest things this Halloween are Fox News and Donald Trump. Even though they are trying to scare everyone by claiming that the US is being invaded by immigrants. You know, immigrants, like the ancestors of almost everyone in the US. Indeed, the immigrants already invaded, long ago. Understanding the importance of data availability is easy enough. Actually achieving high data availability, however, is harder. If you’re wondering how you can improve data availability, keep reading. This post discusses some data availability best practices. Perhaps the most basic step you can take to improve data availability is to ensure that your data is redundant—or, in other words, that you have multiple sources of the data available. That way, a failure in one of the disks, servers or databases that hosts your data will not lead to a disruption in availability. The challenge with redundancy is striking the right balance between redundancy and cost-efficiency. In a world where budgets are a thing, the number of copies of a database or data server that you can have running at the same time is limited. However, by studying data such as how often a given server or database fails and assessing how important different data workloads are, you can make an informed decision about how much redundancy to implement for each data source. Data redundancy is great, but data redundancy combined with automated failover is even greater. That is because automated failover (as the term implies) means that when a component of your infrastructure fails, a backup component automatically replaces it. By eliminating the need to wait for a human engineer to detect a failure and switch to a backup system, Automated failover minimizes or completely avoids disruption to data availability. Many monitoring and management tools for virtual servers and databases make it possible to configure automated failover. And if yours doesn’t, some simple scripting should suffice for ensuring that backup systems come online automatically when a primary system fails. Another simple step that you can take to improve data availability is to avoid single points of failure—meaning infrastructure components or applications that would cause your data to become unavailable if they stop working correctly. The concept here is similar to the point about redundancy made above, but there are differences between redundancy and eliminating single points of failure. You can have a redundant storage infrastructure composed of multiple servers and disks but still be at risk of having them become unavailable if, for example, the network router on which they depend crashes. In that case, your router would be your single point of failure. A well-architected infrastructure would avoid that risk by ensuring that not all data passes through a single router. Generally speaking, software-defined infrastructure and storage help to maximize data availability. That is because when the infrastructure and file systems that store your data are defined in software and not directly integrated with the hardware that hosts them, they are easy to move around and to scale. Keep in mind that software-defined environments can be as simple as a virtual server and virtual disks, which give you the benefits of storage that is abstracted from the underlying hardware. There are fancier ways to do software-defined infrastructure, too, such as by using a file system like GlusterFS or Ceph. But you need not get that complicated to take advantage of software-defined infrastructure and storage in order to improve data availability. Obviously, you can’t migrate every type of data workload to a software-defined environment. And some software-defined environments are more sophisticated. RTO, or Recovery Time Objective, refers to the amount of time that your business can continue to operate in the event of a disruption to data availability. Depending on your industry, the amount of data you collect and other factors, you might be able to continue functioning for days without your data, or you may not last more than an hour before suffering critical damage to the business. If your business is a chain of coffee shops, recovering data instantaneously may not be as crucial as it would be if you are a bank and depend on digital data for nearly all of your operations. If you haven’t yet figured out what your business’s RTO is, now is the time to do it. You don’t want to wait for a data availability disruption to occur before discovering how long your company can continue to function (or not) without its data. Remember, too, that calculating RTO is only half the battle. In order to make RTO useful, you also need to ensure that you can recover from a disaster within the timeframe specified by your RTO. Here again, you do not want to wait until a disaster happens to test whether your disaster recovery plan is actually capable of meeting RTO requirements. Instead, run periodic drills to see how long it takes to recover data from backup databases and to switch to new data server instances to ensure that you are prepared to meet RTO requirements when the time comes. Download our White Paper on Assessing the Financial Impact of Downtime! Design. Everything benefits from having a solid foundation to build on, and your supply chain is no different. True redundancy will inevitably result in multiple variations of your product designs, especially if you’re relying on your contract manufacturers to source local components. In NetSuite, the Advanced BOM feature allows for a specific version of a BOM to be applied to any combination of locations that it’s sourced from – but uniquely, it also allows a single BOM to be associated to multiple end SKUs. This really simplifies things when your dealing with multiple brands of a single item. Making sure that everyone is working from the same version of the BOM at all times reduces errors, ensures optimal cost of quality and should also minimize returns. Having your Engineering Change Order process embedded in your ERP system – unifying design, engineering and execution – should be a critical part of your company’s strategy. And as regulatory scrutiny, criminal prosecutions, and financial penalties targeting the financial services sector continue to grow, effective risk mitigation becomes an increasingly urgent priority. First line: procurement and line of business (LoB) units. These teams must work together to segment vendors across their entire supply chain by risk type and domain, then analyze large volumes of internal and external data to identify and assess supplier-related threats – cybersecurity breaches, bribery and corrupt practices, money laundering, insolvency, data mishandling, regulatory noncompliance – and take actions to manage or remove them. Yet because this data resides in disparate systems controlled by different departments, teams lack the visibility they need to catch potential problems. Duplicate accountability structures can also create confusion about who’s managing what, so risk indicators remain unseen. Second line: governance, risk, and compliance (GRC) teams. This line sets global/regional TPRM policies that help the organization meet legal requirements and gain a comprehensive view of risk issues. It also alerts lines of business (LoBs) to emerging risk trends and offers guidance on how to meet regulations. However, questions frequently arise as LoBs try to implement requirements for their specific business environment, resulting in inefficient one-off interactions that don’t scale. Operational silos and the lack of a central repository to capture and coordinate this information can cause communication problems that increase the chance of compliance violations. Third line: auditing and board of directors. Here senior management represents organizational stakeholders relative to risk issues and maintains oversight, while independent auditors review first- and second-line activities/results to assure the board that exposures have been dealt with. But tracing audit trails through disconnected solutions, spreadsheets, and manual processes often delays progress and impedes accuracy, driving up costs and making institutions more vulnerable to mistakes and sanctions. Strengthen teamwork by aligning people, processes, and technology. Develop an intentional plan for scaling the risk management process that includes the supplier end of the workflow. Seek solutions that automate your risk assessment capabilities through a unified data set and advanced risk modeling, with alerts and controls that let you quickly halt the use of unsafe suppliers and suggest better alternatives. You also benefit from a 360-degree view of risk across all supplier relationships, integrated risk insights to help stakeholders engage suppliers more effectively, and maximized protection for your audit group, executive management, and board. Enhance collaboration and simplify self-service. Focused collaboration can help you nurture long-term relationships with strategic suppliers and build detailed knowledge about how they operate. 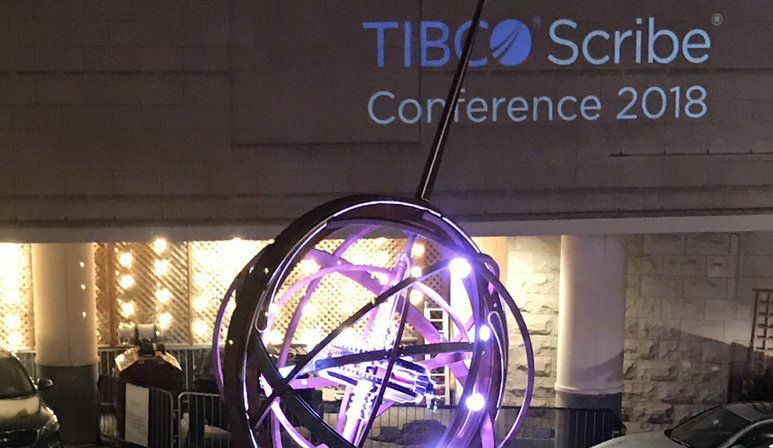 The best technology solutions make this easier by providing a centralized system for supplier data that all stakeholders can easily tap into, with a single repository to encode GRC best practices into specific LoB workflows. Self-service tools give suppliers one place to update their information with visibility to all, reducing fatigue from repeated assessment requests. Get real-time intelligence intelligently. Constant changes in global regulations and supplier risk factors make it imperative to manage data efficiently across myriad sources. Solutions with artificial intelligence and machine learning can dramatically compress the time needed for data mining and aggregation, while advanced analytics ensure fast, accurate supplier assessments. Automated monitoring of large third-party data ecosystems informs you about new legislation and tells procurement, LoB, and GRC teams when action is required. By adopting best practices like these – and the technology solutions that make them possible – you can minimize your risk, protect your brand, and boost your business value to customers and the world. For additional information about effective technology solutions, please attend our webinar in the EMEA region. As a Solution Consultant within the SAP Procurement team , Ruud Willemsen discusses SAP’s purchasing solutions in various ways with customers. Ruud advises companies on how procurement process automation can bring more efficiency and professionalism. Today’s briefing looks at the impact of blockchain on the global food value chain. Last week I was trying to embed a Power BI report into a SharePoint online page. I wanted users in my organization with a free license to be able to see the reports. Sounds easy? I opened the help documentation and went ahead. Unfortunately it was not as easy as it seems as the documentation was missing one crucial point (this will be updated soon). The author of the report is has Power BI Pro (user 1). I created a report a in workspace 1 as user 1. The workspace is hosted on premium so User 2 can view the content. To give access to the report with a large set of users we use apps. Apps support the giving access to groups. So I created an app containing the report. Next share I it with myself and the target audience. I used “Install app automatically” to make sure the app is installed and the user has access. Remember: To have access to the report you need to have the app installed. This is key to making it work! Use the report installed by the app and not the one from the workspace! I now add the report URL I copied in step 7 to the PBI web part. I now go the team site as user 2. Remember: User 2 needs to have a Power BI license. You can bulk assign free licenses to your users if you don’t want them to get a pop up at this point. When user 2 opens the page he can see the report embedded in SharePoint. Share the app to the users\groups who need to see the report, when the app is installed on their Power BI they have access. You can install the app as part of the app configuration so they don’t have to install it themselves. Give access to the SharePoint page to the same group as where you embed your Power BI report. Done No more messing about with apps to control security.